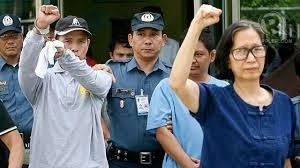 Communist Party of the Philippines-New People's Army (CPP-NPA) Chairman named Benito Tiamzon and his wife Wilma Tiamzon is facing charges for alleged illegal possession of firearms and ammunitions and illegal possession of explosives. They were arrested by the Philippine National Police and considered as one of the biggest arrests that are talked about this weekend. The arrest took place in the island of Cebu wherein there are five others with a multiple murder and multiple attempted murder warrant. After the arrest, on Monday, they were transferred from the PNP Custodial Center to the Camp Crame multi-purpose hall for the judicial inquiry for the incident. Aside from this, the transfer has something to do with the security reasons of the two since they are high profiles and there is a tendency for their security to be jeopardized. The news has spread all throughout the web and television and we can read some reactions from the netizens with regards to the treatment of the government for the two. There are even condemnation for the “illegal arrest” by Luis Jalandoni, the chairman of the couple’s negotiating panel talking about their immunities. The Philippine National Police will go through the proceedings despite the fact that their lawyers are not recognizing it. This is due to the fact that their lawyers have questions with regards to the seizing of the firearms and explosives during the arrest. The CPP-NPA on the other hand, assured the PNP of an honest and peaceful negotiation that will clarify the issue. This could be one of the hottest news the CPP-NPA is involved knowing that the Tiamzons are big names in the group. Police Supt. Roberto Fajardo, chief of the PNP Criminal Investigation and Detection Group-National Capital Region (CIDG-NCR), is confident enough that the proceedings being held by the PNP is legal and fair to both sides. It means to say that it has to be materialized and whether their lawyers will not agree with it, they have to abide with whatever would be the proceedings. You might have your own reaction with the issue. You can leave your comment.